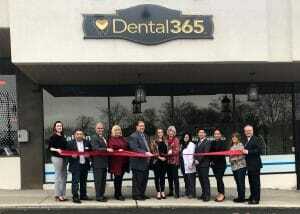 New City, NY – February 7, 2019 – Dental365 hosted a successful ribbon cutting ceremony to announce the grand opening of one of the newest Dental365 locations, located at 195 S. Main St. in New City. With over two dozen community members in attendance, the town of New City and surrounding areas were invited to meet and greet Dr. JungJae Park and the rest of the Dental365 New City team. During the ribbon cutting ceremony, members of the community were provided with a tour of the brand new, beautiful state-of-the-art office and were given an opportunity to speak with the office staff. Included in attendance, were members of the New City Chamber of Commerce, along with members of the Clarkstown community. Frank Borelli, Deputy Supervisor and Councilman for the Town of Clarkstown spoke on behalf of the New City Chamber of Commerce, “We are delighted in having you (Dental365) place your trust and confidence in the town of Clarkstown.” and welcomed Dental365 with open arms. In addition, a special appearance was made by Mrs. Marilyn Reilly, wife of late Dr. Charles Reilly who made arrangements for his practice in Pomona, NY to become part of the Dental365 family. Dr. Reilly shared Dental365’s practice philosophy and vision for providing patients with convenient, accessible and state of the art dentistry, utilizing the latest technology. Dental365 is excited to expand into Rockland County and provide dentistry services in a beautiful office with state-of-the-art technology and amenities in the wonderful community of Clarkstown. Dental365’s goal is to service the communities they are in with the latest technology in oral healthcare and wellness. They accept walk-ins with little or no waiting time for adults and children and offers everything from emergency extractions to routine exams, including cosmetic restorations, implants, and Invisalign, all in a state-of-the-art, beautiful environment where patient comfort is a top priority. In addition, Dental365 is committed to providing dentists with the ongoing education and tools needed to provide the best patient care through Dental365 University, a unique concept built exclusively for Dental365 doctors. For more information about Dental365 or to schedule an appointment in New City, call 845-354-6969 or visit GoDental365.com.